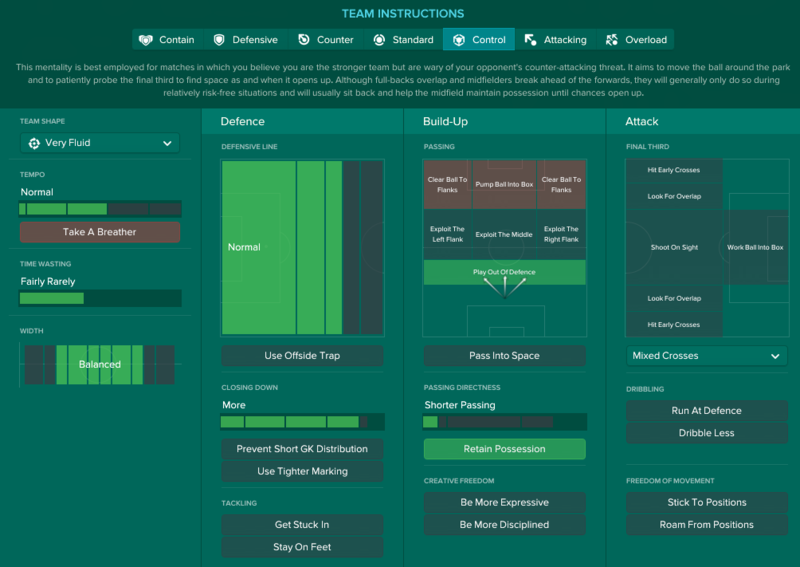 Welcome to the latest instalment in a series of Football Manager tactical recreations based on some of the most entertaining football teams of all-time. Sitting in Barcelona as I type, it is impossible to ignore the the football culture and history associated with the iconic FC Barcelona. After last week's result in Paris and Pep Guardiola's stop-start season at Manchester City, this is perhaps not the most fashionable subject but - to me - Pep Guardiola's Barcelona team was certainly the best I have witnessed and arguably the best of all-time. Their iconic playing style and the best player of all-time - Thierry Henry [/sarcasm] - combined with the supporting cast of Messi, Xavi, Iniesta, Alves, Busquets, Pique, Puyol etc., etc. makes them an interesting prospect for this type of discussion. Whilst Barcelona may not be the biggest challenge - and I am aware many have asked about lower-quality sides - Guardiola's tactics offer us the chance to discuss areas we have not yet covered comprehensively. Mentality - Team Mentality v Team Shape v Player Duty. Specialist Roles - famously the Half-back and the False 9. Multiple Playmakers and how to differentiate between them. Retraining Players, including Player Traits. In addition, Messi - in my opinion the best player of all-time - in the prime of his career. Let's enjoy his ability whilst he's here. I think it may be quite a few iterations of FM before we see another player like him. Once again - using the excellent analysis from Spielverlagerung - this is the shape we are trying to create. In case you have been living in a cave, this is the starting line-up from the 2011 Champions League Final where Barcelona faced Manchester United. Barcelona winning 3-1 and Sir Alex Ferguson describing Barca's passing as a "carousel" in a game widely regarded as one of the defining games of Guardiola's Barcelona. Lined up in a 4-3-3 or 2-3-2-3 formation - defence, midfield and attack highly integrated with each other. Playing style clearly inspired by Dutch Total Football and Cruyff's influence at the club. Guardiola once said, "Cruyff build the cathedral. It is up to us to maintain it". Focus on intelligent, technically gifted players. Position - Juego de Posición. Team is structured into triangles with players between the lines, giving the player in possession options. Busquets drops deep, central defenders spread wide and the wing backs push forward to create numerical superiority building up from the back in what's known as la Salida Lavolpiana. Messi also drops deep, linking up with Xavi, Iniesta and Busquets creating a diamond in midfield. Wide Forwards stay wide during build up, stretching opposition defence and creating space for creative players in midfield then given licence to cut inside when the ball hits the final 3rd. Possession - don't say tiki-taka. Controlling possession and moving the opposition, to create weaknesses elsewhere. One of the most technically gifted teams in history. Dual playmakers in central midfield - Xavi acting as the heartbeat of the team playing deeper and recycling possession, whilst Iniesta is more advanced, creating chances and linking with the attack. High block defensive line controlling space. There are a lot of rather sophisticated - and potentially complicated - tactical concepts here, but we actually don't need to deviate too far from the playing style we have already discussed. Last time out we discussed the concept of Playing Style and Structure. Let's now apply that concept, to the points we outline above. How would you like your team to attack? quick transitions and fast attacks? Attacking wide? Controlled build-up from the back? Playing through the centre? Long balls? Counter attack? Tiki-taka? How would you like your team to defend? Intense pressing? High block? Sit deep and maintain structure? Low-Block? Park the bus? Is your approach to give players an NFL style 'play book' telling them exactly how to play, or the freedom to make decisions? What formations can you play with the players you have available? How would you like to structure your defence / midfield / attack? Do you need a playmaker? A target man? Who is provides width? Who is holding in midfield? Who is making attacking runs? Do you really want to play that Attacking Libero with a Regista and aggressive front-6? Playing style is going to be more evolution than revolution. We have already mentioned that Guardiola's style is heavily influenced by Cruyff and the Dutch school of Total Football. Highly creative, free slowing football. Team working together, attacking and defending as a unit. Possession orientated game-plan, short but positive passing. Higher Defensive Line & Pressing. Surprise, surprise. Hello, old friend. If you've read previous threads, this will not be a surprise. Very fluid gives us the creative, free-flowing football and ensures the entire team attacks and defends as a unit. The main evolution to playing style. With a just a handful of Team Instructions we are able to create the playing style we want. More Closing Down - has the knock on effect of increasing tempo and defensive line. Play Out of Defence - shortens the individual passing instructions for my defensive players. Shorter Passes - shortens passing across the team and lowers tempo. Retain Possession* - further shortens passing. Can further decrease tempo but doesn't when combined with More Closing Down. Getting pretty minimal now, which I am very happy with. As outlined above Team Instructions usually have knock on effects and I think this causes a lot of problems. You can easily add loads and lose track of what you've changed. Keep it simple until you know what your doing, and even then keep it simple. * Retain possession is a controversial subject. @Rashidi wrote an insightful thread on the subject last year. This is my first foray so I won't pretend to be an expert but it does have the desired effect in my system. Retain possession was the last team instruction added and the reason was as a defensive measure. We conceded 12 goals in 8 games at the start of the second season mainly from the opposition countering quickly when we lost possession. Retain possession cut the problem at source by reducing the number of times we lost possession and we finished with the 3rd best defence in the league, despite an attacking shape. 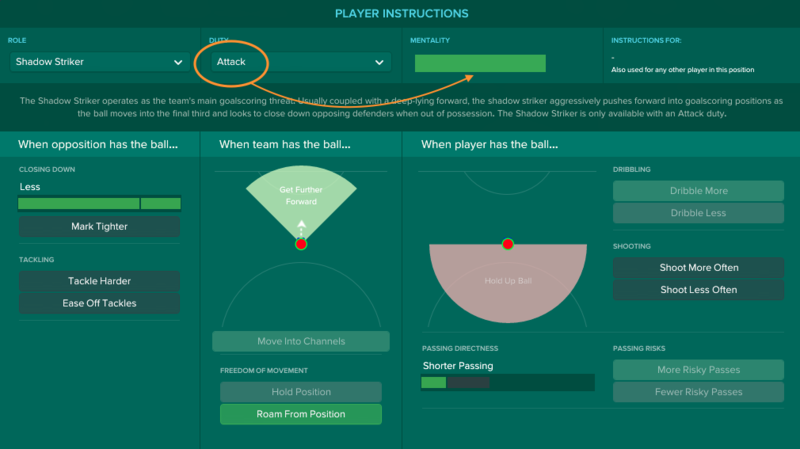 Side effects have been rumoured to include fewer through balls and long shots - this may no longer be the case or is simply not represented visually in the Tactics Creator. Regardless - as you'll see - we had no issue creating chances and over the season 50% of our shots were on target. The most important thing about Playing Style and Team Structure is that they complement each other. Team structured into triangles with players between the lines, giving the player in possession options. Busquets dropping deep, central defenders spread wide and the wing backs push forward to create numerical superiority building up from the back in what's known as la Salida Lavolpiana. Messi also dropping deep, linking up with Xavi, Iniesta and Busquets creating a diamond in midfield. In previous threads we have discussed how Very Fluid team shape means that individual mentalities will deviate minimally from team mentality - if you attack, everyone attacks. If you defend, everyone defends. Control is a reasonably aggressive mentality - more aggressive then Standard, but less aggressive than Attack or Overload - so my Team Structure must balance that. 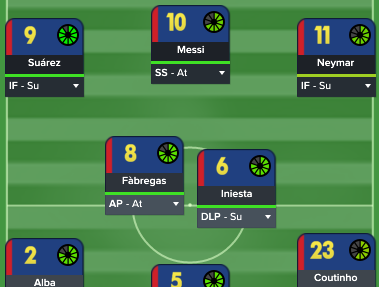 A second consideration is that in order to have Busquets dropping back and my centre backs spread wide, firstly he must be in the Half-Back role but also - due to a glitch in the match engine - my fullbacks must be in the wingback strata, otherwise my central defenders won't spread wide. We have increased mentality across the team. Our hand is forced into an aggressive Formation. Mentality is probably up there with Team Shape as the cause of the most confusion for a lot of people, but - in my opinion - it is actually incredibly simple. Mentality is mentality. Mentality describes perfectly what it does. It's probably safe to assume that most people reading this have - at some point - played football or some kind of sport. Now, think about your mentality when playing and how you act differently. If you're an attacking player, you're more likely to be passing the ball forward, more directly towards goal, take up more advanced positioning and make more attacking runs. As a defensive player, you're more likely to take up a conservative position on the field and your passing, movement and general play will effect that. Then of course there is everything in between, and extremes at both ends - all out attack or holding on to a 1-goal lead in the last minute of the Cup Final. 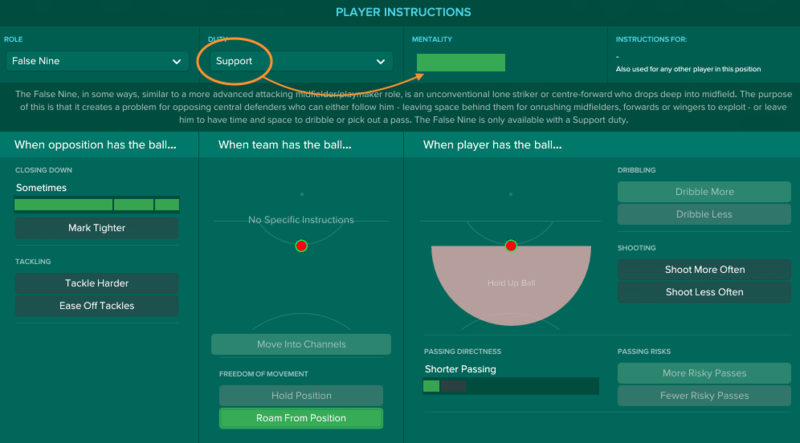 In Football Manager a player's mentality is reflected in a hugely-informative[/sarcasm] green bar, tucked away in the player instruction screen. If you're numerically minded - like me - @GreenTriangle put a helpful spreadsheet together of the 'under the hood' values, reminiscent of the old, slider systems. Team Mentality - increases or decreases mentality across the board. Team Shape - determines how far individual mentalities deviate from the team. Player Duty - specifically duty, not player role. Player Duty is relative primarily to Team Mentality, but also Team Shape. Team Mentality determines whether your team is attacking, defensive, somewhere in-between or either extreme. A player's Duty, determines whether their responsibility is to attack, defend or support within that team mentality. Then Team Shape determines how far a player's Duty will make their individual Mentality deviate from the Team Mentality. Structured systems have more deviation, whereas more Fluid systems are more of a unit. For example, not all MC(A)s are created equal - in fact, differences can be large. In an Structured, Attacking system the MC(A) mentality is 17 / 20 where as in a Very Fluid / Defensive system that mentality is reduced to 8 / 20. In real football terms that's the difference between, "we're going to play an attacking system, everyone's got their own roles but you're the spearhead" and "we need to defend as a unit, attack when you can but be very careful". The challenge of going from a Standard mentality to a Control mentality is that - across the entire team - mentalities increase by 20-30%. Slightly below neutral - if neutral is 50-50, they're 55-45 in favour of being conservative. In real football terms, players with a Defend duty will be slightly more conservative than neutral, but only just and higher than a typical defender. They'll be involved with build up, playing pro-active football but remain reasonably conservative. Slightly above neutral - if neutral is 50-50, they're 60-40 in favour of being positive. In real football terms, players with a Support duty will be slightly more positive than neutral. They'll be playing positive football, more inclined to more the ball forwards as opposed to side-ways and support attacks yet remain reasonably sensible. Pretty comprehensively attacking. Looks like 75-25 in favour of attacking. In real football terms, players with an Attack duty mean business. They'll be strongly inclined to attack - not quite at all costs, but pretty heavily - the ball will be going forwards at goal and they'll be looking to score. If I was to be 100% accurate, I would perhaps skew my wing backs roles to create the Abidal / Alves roles to something along these lines, however I just do not have a player for the Abidal role at the moment. Not sure this represents anything overly groundbreaking here. Only one falling off his chair at this point is probably @Guimy at the sight of my first Strikerless system - of which I'll explain more detail shortly - otherwise, I'd be fairly surprise if anyone had not seen or thought of similar systems before. In comparison to previous systems we are using a lot more Support roles and fewer - but more potent - Attack roles. The wide players are the main difference between this and my last 4-3-3, moving from Attack to Support. For both Wing Backs and Inside Forwards - outside of mentality - the changes are negligible. IF(A) is hard coded to Get Forward More. IF(S) doesn't automatically Get Forward More, but has the option to. IF(S) will also automatically play More Risky Passes. WB(A) automatically Gets Forward More, Run Wide With Ball, Dribble More, Cross More & from Byline. WB(S) automatically Gets Forward More & everything else is optional. Complete Wing Back (Support) has the mentality of the WB(S) but the instructions of the WB(A) plus Roam From Position (which apparently = Complete, to SI). The first of my joker cards In the Football Manager Tactics Creator we are spoilt with a number of remarkably similar Roles for Strikers / Attacking Midfielders. Position - DMC, MC, MCR, AMC etc. Duty - Defend, Support, Attack. Movement - hold position, get forward, roaming, wide, cutting in etc. Other PIs - crossing, shooting, hold up the ball etc. Lionel Messi is probably the best player I have seen since Ray Parlour and he is famous for the False 9 role. Move into Channels, Risky Passes and Dribbling all hard coded. Option to Roam from Position. The False 9 starts in the striker position and moves away from the goal, creating space for others. The Shadow Striker starts deeper in the AMC position, but aggressively attacks the space ahead of him. The role you chose will depend on the way you see Messi and we probably all see things slightly differently. To me, Messi is way more the latter - he's deep, he links with midfield, draws defenders towards him and attacks the space. Looking at his goal record and watching some of his goals I would be advocating an Attacking mentality all day long. There is a reason I left the tactics screen above without a team selected. Whilst our Team Structure and Playing Style may have been reasonably vanilla in comparison after previous threads. Squad development is an area we can throw in a couple more joker cards and hopefully make it worthwhile reading. A common misconception is that particular tactics will instantly turn no-hopers into world beaters. Unfortunately - whilst there are always tactics which will optimise what you have - until SI implement a "Play Like Messi" instruction, sticking Per Mertesacker up front and calling him a False 9 is not going to make him play like Messi (but maybe Peter Crouch?). Whilst many are admirably grafting away, gradually turning their lower league team into world-beaters I have been having a whale of a time taking one of the best squads on the game and throwing £280m at it whilst shipping out £230m of dead-wood or mis-fits. Best squad I've ever had. Bar none. Couple more joker cards. Messi, Iniesta, Neymar, Coutinho, Dybala and Suarez all in the same starting XI. 6 players playing in retrained positions. Neymar in the Messi role. Messi in the Iniesta role. Iniesta in the Xavi role. Yes, that's Philippe Coutinho at right wing back. Last time out we looked at the differences between our options for Player Roles - Regista, Roaming Playmaker, Deep-Lying Playmaker, etc. This time let's think about the player performing the role. Technical ability - Technique, First Touch, Passing. Intelligence - Vision, Decisions, Anticipation, Composure. The original triumvirate - Messi, Iniesta & Xavi - plus Özil, Pirlo and Totti. Average age is very high - only Özil and Messi below 30, 3 players over-35. Players with widely differing styles - Pirlo to Xavi to Özil - have remarkably similar core attributes. When building a new team, my instinct is always to find a young player with potential and a reasonable attribute profile, tutor, give game time and let them grow into the role. In keeping with Barcelona's ideology, I attempted the same with Samper and Aleña but they are limited from reaching elite-level by their potential. Xavi and Iniesta are both legendary midfielders, absolutely at the top of their game. Not only their intelligence and technical ability, but also their experience allowing them to exhibit total control over games. This is why I opted for experience. Addressing the second point - how do we differentiate playmakers from each other with such similar attributes? Player role and how they are utilised tactically. Auxiliary playmaker attributes - particularly Team Work & Flair. Team work determining how likely they are to create chances for themselves vs team mates. High across the board but lowest in Messi, who happens to have the best goalscoring record of the group. Flair being the ability to create a moment of magic and do the unexpected. High for all but Xavi who was famous for his simple approach. Non-Playmaking specific strengths - dribbling, set pieces, finishing, strength, work rate etc. Inherent characteristics - preferred foot, (to an extent) size). Xavi was undoubtedly one of the most intelligent and technically gifted midfielders of all-time and the heart-beat of Pep Guardiola's Barcelona. Xavi's role as a playmaker was more that of a conductor - controlling and recycling possession, switching play, connecting the entire team. Either Deep-lying Playmaker (Support) or Roaming Playmaker (Support) depending on whether you're able to hold control of the midfield or need to move to find space. Incredible intelligence and technical ability. Comes Deep to Get Ball. We can see, he's already got the intelligence and the technical ability but his traits are very direct. As a result, playing in the deeper role, he's going to try to directly create chances from deep rather than perform the controlling role we are looking for. Start dropping deeper to get the ball. Physical stats have began to decline sharply but by maintaining his high level of ability by carefully managing his game-time and training he has become more intelligent and further improved his technical ability. Iniesta's role in Guardiola's Barcelona was that of a more advances playmaker, linking midfield with attack and creating chances. Incredible technical ability and intelligence. Switches Ball to Other Flank. Looks for pass rather than attempting to score. Retrain as a Central Midfielder. Tried but failed to Develop Weaker Foot - I believe due to maxing out his CA vs PA. The idea of Messi playing in midfield, coming deep to get the ball and then moving forward aggressively with 3 world-class attacking options ahead of him or going himself is - quite frankly - devastating. My scouts rating Neymar as a similar level of ability to Messi by the end of the season and - whilst performing very well - not quite reaching full-potential on the field playing wide right. Like Messi under Guardiola, Neymar moved central - initially as an experiment - and absolutely exploded. Messi dropped deeper into the midfield playmaker role and Cesc moved on to PSG for a modest profit after a very successful yet brief 3rd stint at the club. Dani Alves is a special player. Wonderful Brazilian style attacking wing back. All round football ability - people have even called to see him in midfield. Solid defensive ability, which developed over time. Flair, work rate and fitness are inherent to his overall game. Ahead of the 2016/17 season I had a big decision to make. I had the option to sign Özil - as we have already identified, one of the few elite level playmakers capable of the Iniesta role perfectly - or Coutinho. But I couldn't sign them both due to financial constraints. Time required to retrain Coutinho meant I wanted him early, whereas maybe I could get Özil later. Scarcity of players with flair, work rate, fitness, a good right foot and the attacking ability to play right wing back. Availability of Cesc Fabregas as a cheaper alternative to Özil. Coutinho's progress has been gradual. It took the entire first season to reach Accomplished at right wing back and has not reached natural after two seasons. Attacking threat, technical ability, all-round footballing ability, fitness and intelligence come ready made whilst defensive ability is improving gradually. 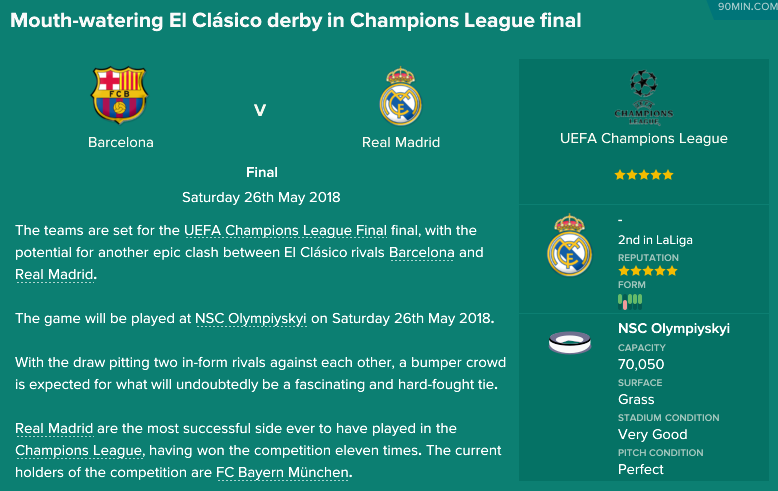 You join me for the 2018 Champions League Final - the ultimate El Clásico. Having beaten Real Madrid - once again - to La Liga and put two big scores on them in the League, they were out for revenge. Zinidine Zidane is still in charge has actually had two very strong campaigns despite losing out on the trophies. Perhaps under pressure for his job if it doesn't go his way. 4-1-4-1 is a bit of a surprise as Real Madrid have heavily - and successfully - used 4-1-2-3 all season. The big money acquisition of Eden Hazard has pushed Karim Benzema onto the bench, moving Ronaldo centrally. Ronaldo has thrived centrally in the 4-1-2-3 - hitting just under 30 league goals - but I'll be looking to ask questions of him with less support in the 4-1-4-1, trying to cut off supply and isolate him. 4-1-4-1 offers brilliant defensive coverage but the challenge is supporting the striker. You'll notice that in my 4-1-4-1 my striker is on Support and midfield runners rush forward. In Hazard, Kroos, Kovacic and Bale, Real Madrid have runners, but I'd imagine Ronaldo in an attack duty and his traits will drive him further forward - will we be able to isolate him and then exploit the space left by the midfield runners? Very Fluid - attacking and defending as a unit, forwards mentality is closer to team mentality meaning they will lead the press. Control - pushes defensive line, closing down and mentality - across the board - higher. Support duties - ensures my Inside Forwards and Wing Backs are track back and mitigate their aggressive starting positions. Work rate, determination, stamina, team work. Real Madrid attempting to build up play from deep. De Vrij advancing with the ball after a Real goal kick. Front 3 lead the press, hassling the opposition back 4, disrupting building up play and - ideally - forcing a long ball. A midfield wall consisting of WB - MC - MC - WB pressuring the opposition midfield and shielding the defence. Defensive triangle DC - DMC - DC outnumbering opposition attack. 'Busquets zone' protecting the centre of the field. Thinner dashed lines show the distances between the WB and the centre back behind and the wide forward ahead - a particular concern building this tactic. Note: in a standard mentality we use more pressing TIs - Higher Line, Close Much More, Tight Marking, etc. Using Control, we simply use Close Down More and notice how advanced we are. Already a risk, any higher would be overkill. Ideally the "Sweeper" Keeper would "sweep" more, but I can't make that happen. Real Madrid handicapping themselves by dropping Casemiro at DM into the defensive line (to aid build up) but failing to spread the defenders. Look at how close Casemiro is to Varane. Effectively taken himself out of the game, allowing us an extra man advantage - see Busquets. Real Madrid in a more advanced position, attempting to build an attack. Pressure on both the player making and receiving the pass. Wing backs and wide forwards have both adopted deeper, defensive positions creating a compact 4-1-4-1. We have a 4-man defensive line of WB - DC - DC - WB with Coutinho advancing to put pressure on Hazard. Busquets is shielding, again holding that vital position ahead of the defence and cutting out any passing option to Ronaldo. Alba is tucking in. Bale does have quite a lot of space, but with the ball on the other side of the field it'll take a while to reach him. Alba is well positioned to track a dangerous run at the far post. Wide forwards replace wing backs in a 4-man midfield screen. Neymar tracking way back creating a 3v3 on the opposition midfield, leaving Busquets free again. Real Madrid playing conservatively, neither their full backs or central midfielders making a run leaving Hazard, Ronaldo and Bale outnumbered. Starting from a goal-kick, Barcelona attempt to build an attack from deep. Busquets drops deep, between Pique and Romagnoli. Pique and Romagnoli spread wide - in this case, Pique draws Ronaldo with him. Wing backs push forward, creating a 3-4-3 shape. Messi and Iniesta drop deeper to offer passing options - in this instance, Iniesta is marked but Messi is open. Busquets is unchallenged and can progress with the ball, drawing out a defender to create more space for Iniesta and Messi to play through the middle. Suarez and Dybala retain their width, stretching the opposition defence. Neymar free to roam from position to create a diamond with Iniesta, Messi and Busquets, find a pocket of space and/or make an attacking run. Neymar is pulling the Real Madrid defence forward leaving lots of space behind. We have technical players with space and time to play a pass. We have very dangerous attacking runners in Dybala, Suarez and Neymar. Not normally one for the stats - as @Cleon pointed out in his Art of Possession thread, stats are often calculated differently - but Iniesta set some hit some stand-out achievements pulling the strings in his new role. 92% pass completion over the course of the season. Averaged nearly 75 passes per game. Completed 125 passes against Real Madrid in the Champions League final. Over the course of his career, Messi has been a winger, an inside forward, False 9 and a playmaker. As the best footballer of his generation, he would be the best in the world in almost any attacking role. There are a couple of advantages of playing him in midfield. More involvement, receiving the ball earlier. Passing options ahead of him, rather than behind. Receiving the ball from Iniesta and Busquets deep, Messi turns and runs at the defence. Almost anything could happen here. As we hit the final 3rd, the wide forwards - Suarez and Dybala - have cut inside. Wing backs drive forward providing width. Neymar has options for different attacking runs and space in behind the defence to attack. The concern with Messi in midfield is his work-rate but he actually covered more ground than anyone in the league. Messi dropping deeper to take on a midfield playmaker role opened a space at the top as the spearhead of the team. Neymar - like Messi many years before him - moved inside from his wing taking up the "False 9" role, and never looked back. Won the La Liga, Copa del Rey, Champions League treble. Completed an unbeaten season in all competitions. Broke the La Liga goalscoring and point scoring record with 143 goals and 102 points. So far the response to these threads and discussions generated have been absolutely phenomenal so once again I wanted to thank everyone for contributing as I have really enjoyed it. A couple of people have suggested they'd like to contribute financially to support the series so I have set up a GoFundMe page - Football Manager Analysis. I'd like to be 100% clear that these articles are completely free and will always continue to be. Contributions are simply supporting the work that's been done so far, if you've enjoyed them. As I am sure you can appreciate - whilst I love writing them - a lot of time & effort goes into these. Any contributions are very much appreciated. If we reach the conservative goal of £100m I am going to sign Nicklas Bendtner. I am going to finish by saying that - for those who have read a long so far - I think we have now talked through pretty much all of the tools you'd need to build your own system, if you have a different inspiration - for example Bielsa, Klopp, Pochettino. Please shout if there is anything you feel lacking and I will include in future threads. Edited February 27, 2017 by Ö-zil to the Arsenal! This post has been reserved to talk about La Masia & Youth Development. 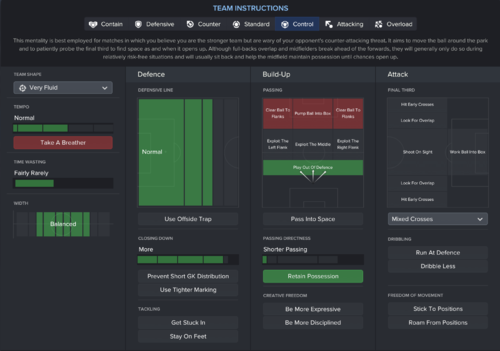 Managing your Squad to facilitate Youth Development. If there are any other areas people are struggling with on the Youth Development side please raise them here and I will add to the list. Edited February 26, 2017 by Ö-zil to the Arsenal! Reserved 2 - TOP SECRET. Reserved 3 - TOP SECRET. Reserved 4 - TOP SECRET. Congratulations for your posts. They are always a must read. - I know you have retrained some players but... To be honest, I don't see this working in real life. Maybe against very weak teams playing very defensive but not regularly. Could you explain this for me, please? Instant bookmark. Can't wait to read through. Edit - Wow. Possibly your best work yet. Two questions immediately come to mind. 1. Do you use any man marking instructions? The obvious one would be on the IFs to mark opposition fullbacks. Assuming no because you didn't mention it but it's been something I've done to ensure players from the AMR/AML strata sufficiently track back in low block phases. 2. Are you pleased with the build up shape shown above? Generally curious, not a criticism. Three ~wide players seems a bit redundant given the lack of players occupying the half spaces. I'm inclined to say the WBs should be narrower (at the least the far side one) but I don't want to draw conclusions from one screenshot. I imagine the CMs also occupy these vacant half spaces in times when they aren't supporting the DM so closely. You say more closing down increases the tempo but I thought that isn't the case anymore? It was the old hassle shout that increased tempo and now close down more and much more just affect closing down. Interestingly, played around a little and it doesn't increase it in every system. But does in mine. Perhaps dependant on another Team Instruction or a particular variation of Mentality and Shape. 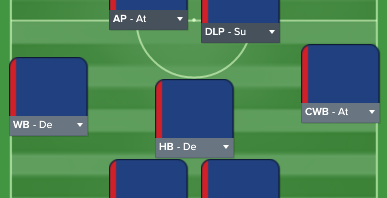 It's probably the most aggressive formation and player selection I have used, yes. As I mentioned I did also have to iron out defensive issues as well. It wasn't easy but it was never suicidal. It's certainly something for top quality players and players need to be suited but - actually - 2-3-2-3 balanced with heavy use of Support roles would now be one of my go-to formations. I loved it. 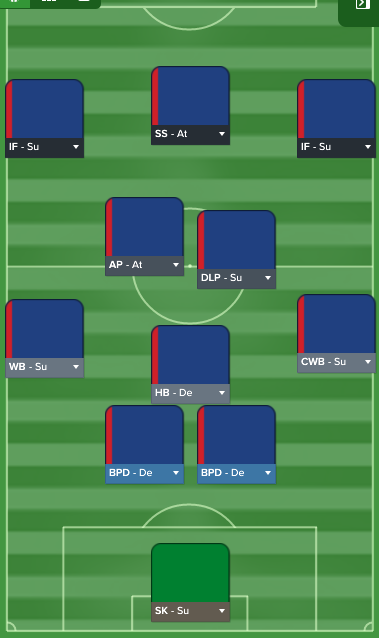 If I was to give an idea of scale - in Football Manager 2017 - this is not as solid defensively as the 4-1-4-1, Sacchi system or - certainly - the Wales system, but it's about as solid as the Cruyff 3-4-3 and the Wenger system. It outscored everything - perhaps due to quality of squad - and controlled possession far better. Only the Cruyff 3-4-3 could compete there. Great job as always Ozil. Always look foward for you threads and always learn something by reading them. @Ö-zil to the Arsenal! Do you have a blog or do you exclusively post content here? A brilliant post. Thanks for taking the time to post this. Some nice ideas and concepts here that I'll look to take to my AEK save, if and when I have the players available to make it work. One thing I often neglect to do is set player preferred moves. 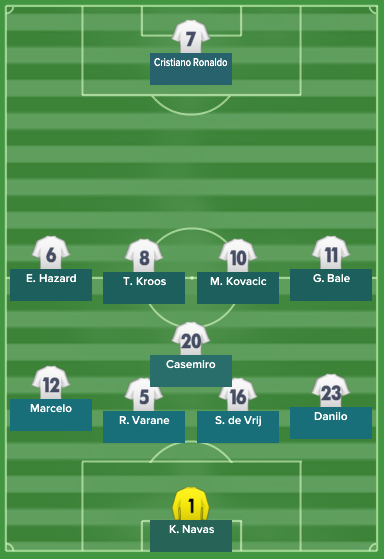 Primarily because I usually have players who can play in more than one position, e.g., my current CMat can also play BBMsu and DMde, so whilst I'd love to have him coming deep to get the ball, I wonder how this might affect the team if I move him to another position. I don't have the riches for a player or two to a position. Finally, I wonder how your ball-playing defenders are working for you, given you want to play out from the back? Are they good at keeping possession for you? Interesting stuff and I think that's most successful aggressive system I've seen which is no mean feat. However the screenshot of the team playing out from the back further emphasises the need for greater tactical control in the game, the two central midfield players have almost the whole pitch to spread out create better passing angles yet they're cramped together whilst the DCs and WBs are miles away. A set piece creator like instruction would be useful for goalkicks. Additionally having more control over player positioning is needed in general but I appreciate that's difficult to implement. Well this is interesting. Cracking results! I can't settle on a particular save this year, might use this as some inspiration. I found that incredibly interesting to read - that's quite a starting XI you have there but the attention to detail is superb! Great job. I nearly chocked on my breakfast seeing Coutinho at RB. Such a weird picture in my head. I guess it is not completely out of left-field. He is defensively capable, for a #10, and Guardiola was famous for his wacky retraining, as he wants players who are capable on the ball all over the pitch. I have to disagree on Messi's role, but to each his own. I guess he was playing all sorts of roles at different times. Have you considered other roles for him? For me, a Shadow Striker always seemed like too much of a "goal scoring" role. More Fabregas than Messi. A Treq would have been where I'd start. Spot on the midfield trio. Not only you got it a 100% right, but it was my favorite midfield combo last season. This is a great opening post and I'm gald to see you got more updates coming, can't wait. Inclined to try to implement this one at Man City at one point. I guess it will take more than two seasons to win the treble, but there are more than enough ressources to get in the puzzle pieces needed. The thought of a CM-AM of Gündogan-Silva-Sané-Aguero-Sterling is neat, though. I do not have my own blog but I have posted on Cleon's SI Sport Centre and @LPQR's Asymmetric. Thinking about doing one of my own but for now you can find everything I have written on here. Player Traits are - in my opinion - very important for playmakers. Look at how similar the attributes for Pirlo, Iniesta, Özil and Xavi are but then look at their Traits and you see how they're all completely different players. The Ball Playing Defenders are working nicely. Team Instructions - play from defence, short passing and retain possession - help a lot. Haha, yes. A few people got it. Wasn't anticipating taking so long to write after the "preview". The playing style was simple but Guardiola's structure is so sophisticated it took a while to explain. 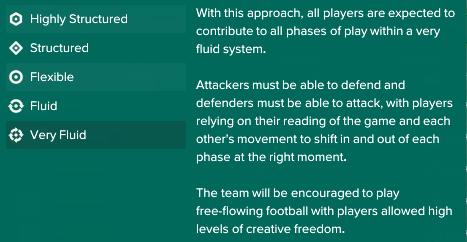 That's a very interesting idea about build up play. Roaming Playmaker as opposed to Deep-Lying Playmaker may mitigate slightly. Finding world-class attacking wing backs is bloody difficult. Easily the toughest positions to fill. Initially I went conservative with Bellerin but he'd just not a complete enough all-round player, and doesn't have the Flair. Florenzi at Roma was also seriously considered but I still felt too conservative to do justice to Alves. Ready-made attacking attributes - pace, dribbling, flair, etc. Ready-made technical ability, intelligence and creativity. Versatility to play in midfield, or inside forward roles. The real area for development is tackling, marking and positioning but the pro's outweigh the con's for me. Interested to see what happens when he hits natural at Wingback and I can start using Cleon's training rotations to get those attributes up. I agree. Man City is an interesting proposition. Not 100% sure I can bring myself to do it but I think you should have all the resources you need to turn those guys into a very, very formidable unit. I like the idea of switching out a wingback for an inverted wingback and using Gündogan in an all-action midfield role. On the PIs you have an Advanced Playmaker but on the second screenshot where you show your starting eleven you have an IF there. The Advanced Playmaker is the MCL. Edited to make that a bit clearer. Yeah I noticed that too. I wanted to ask about that. 1) Very fluid =more generalist roles. Would having 3 playmakers work? 2) I always thought it's important to have a sitter and runner in midfield. U have two playmakers and 1 sitting back (busquet). Who are the runners that run onto the passes from your two playmakers? Just the two IFs? 1) That was part of the reason for attempting this style. If you have read previous threads, you'll know that I started out sticking to that rule-of-thumb almost religiously. As I have played more and observed what different "specialist" roles vs "generalist" roles do, and become more experienced and confident in my understanding I have expanded on it. Does the role offer the duty I want for this player? Is this role a playmaker? What movement does this role offer? Must have said it a million times now but box-to-box midfielder is classed as a Midfielder (Support) plus roaming. That's it. So many of the choices you're asked to make are that negligible and over-complicate things hugely. By traditional standards sweeper keeper, ball-playing defender, complete wingback, half-back, deep-lying playmaker, advanced playmaker and shadow striker are all considered specialist but there is no inherent difference between them and other roles. The difference is simply their movement and - in the playmakers case - being playmakers. Complete Wingback (Support / Attack) v Wingback (Attack) - CWB(S) offers a lower mentality but still attacking movement, WB(S) is a great blank canvass. The advantage of "generalist" roles is that they are a blank canvass. Eg. MC(S), WB(S), IF(S), W(S) have very few hard-coded instructions, you can do what you like. The biggest challenge is multiple playmakers. I observed - not 100% sure if it's correct - that the Advanced Playmaker is a priority, so receives the ball more. Whereas I want the Deep-Lying Playmaker to receive more of the ball, but play sensibly and the Advanced Playmaker, get it when he's free but when he does, create chances aggressively. The Team Instructions are configured to optimise this but regularly the AP(A) is still prioritised. 2) You're correct. It's a tougher balance. Half-Back isn't a playmaker, but it does really facilitate build up from deep. Messi makes runs but in general, they work as a creative tandem and the runners around them are the wingbacks, inside forwards and shadow strikers. The system is very integrated. Built entirely around that creative hub in the middle. Yeah I see that, but on the first screenshot of the team bellow Formation, Player Roles and Duties you have the left winger as an advanced playmaker but on the second screenshot you have an IF. They are both IF according to you, the 1st one might confuse some people. Very well spotted. Fixed. No idea how that happened. Never even considered a playmaker out there! In fact, I'm tempted to try and implement a similar system at Arsenal. I generally always go with worse teams and have never had a long term with a big club, plus IRL it is the type of football Arsenal want to play but can't. @Ö-zil to the Arsenal! fantastic work as always! Great analysis and wonderful work in terms of simplifying systems and the process of linking everything together. Top presentation as always too! Hey Ö-zil to the Arsenal!. Thanks for that great topic! 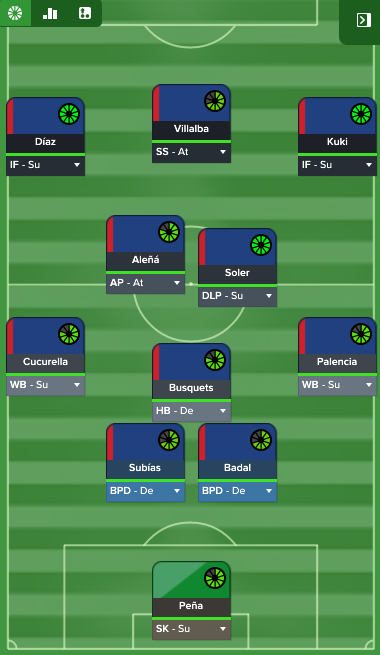 Recently I've made tactic inspired by Pep Guardiolas' Barcelona, to my Malaga save and im pretty happy with final result. When I was thinking about fluidity, I found some problems. Barcelona style of play had some parts of fluid/very fluid style, but also some of rigrid. Compactness of lines, changing positions, whole team involved in defensive as well as in build up looks like fluid systems. But theres some examples of rigrid style. I think Peps' players wosn't allowed to creative freedom, almost at all. Ball distribution in build up play was highly planned. Only Messi, Xavi, Iniesta and Alves was allowed to improvise. Xavi and Alves with their passing, Iniesta with dribbling and Messi with both. 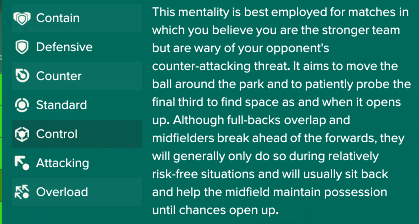 For me Barcelona mentality in FM terms was defensive/counter. No other mentality allows more save passing options to control the tempo rather than risky pass to score a goal. In the midfield I use DM(S), Roaming Playmerker in DM strata and AP(A). Half Back role usually f**** up my CD positioning, and "comes deep to gets a ball" PPM makes DM(S) really similar in hes behaviour to Toure/Busquets. 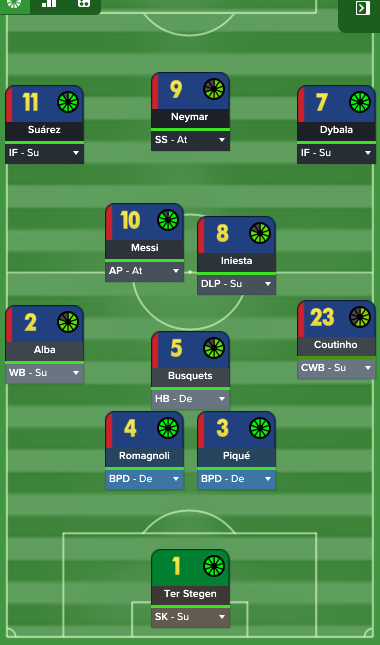 What do You think about recreating Barcelona 08-12 with Defensive/Structured options? edit: and what do you think about Oliver Torres attributes for this kind of football? Arsenal aren't a million miles away from being able to pull this off. Özil and Cazorla are perfect for the midfield. Sanchez can be the Shadow Striker or wide left. Need to take a look and a think about the Half-Back. Xhaka doesn't have the defensive intelligence for me. Defensive and Structured, with this distribution of duties would result in considerably lower mentalities so lots of side-ways passing, very conservative play and minimal creative freedom to break from that. You'd probably get good possession and passing numbers but - to me - it'd be tika-taka at it's worst. You'd need to think very carefully about how you turn this into positive, pro-active football. I can understand where you are coming from in terms of Guardiola having structured teams, however I think we are misusing the word structured in an FM context. The structure in Guardiola's case is the half-back dropping deep to get the ball, with inside forwards staying wide until late on, the controlled build up play, triangles in midfield etc, etc. None of these things require using a Structured team shape, instead you implement them in your team structure. Apologies if that is complicated. Think this way - Very Fluid gives your players freedom to play football within a structure / framework. Which - in my opinion - replicates Guardiola, but we do all see football differently so do what you see fit. Aww I got a bit excited coz I have been considering playing Chelsea this way and wanted to see how u were planning on doing it with 3 playmakers and justifications for doing so. I have Hazard as AP(s) in AML, and Oscar/Tielemans as AP(a) in MC alongside Hjojberg/Lewis Cook DLP(s) in MC. I agree, plus they have the funds to do the squad building necessary. Cazorla/Ozil was my initial thought when looking at this system too. In terms of the HB, definitely would need to bring someone in, there are a couple of players I have in mind, they're generally older but at least I'd have the money to bring one of them in as a stop gap whilst I nurtured some younger prospect into the position. Hmmm, might get a save going this evening. It would be interesting to see how a system like this functions in the Premier League too against generally stronger opposition. Sorry, maybe I didnt phrase my question correctly. What I mean is this: Rashidi often says that with a very fluid/fluid formation, u need to create space due to the compact nature of the shape. This means movement between the lines. Now when I look at your formation, I see two playmakers: one AP(a) and one DLP(s). The only person I see advancing from midfield strata to final third strata would be maybe just your AP(a). Your two IF(s) have instructions to "get further forward" and your SS can only have an attack duty, thus means will be looking to get further forward too and exploit the space in front of him. This puts incredible pressure on your AP(a) to be the movement between the line from midfield to final third. Is this analysis correct? Or have I missed something? 1. How were goals distributed amongst your team? Did you have your wingers and central midfielders contributing? 2. Also Barca, like Burnley in those days, played short corners. Was that something you attempted to implement? Did you have much success? Also really looking forward to the La Masia part of this thread! Youth development has become my top priority since brexit royally screwed us. Without the full context it's difficult to see exactly what is meant by the section from Rashidi there. To me, creating space and movement between the lines is essential, regardless of team shape. In this shape, there is probably more movement between the lines than anything else I have done. Half-Back dropping between the centre-backs, creating a back 3. Wingbacks pushing forward to create a midfield-4 in attack and back to create a defensive-4 in defence. Deep-Lying playmaker reasonably static but drops deep into the space vacated by the Half-Back. Inside Forwards and Shadow Striker starting deep, compact with the midfield and drawing out opposition defence and having space to attack in behind. Advanced Playmaker advancing into the space left behind the Shadow Striker as he attacks. Inside Forwards staying wide until the final 3rd, then cutting inside and wingbacks overlapping maintaining width. All of this aided by Very Fluid structure giving them freedom to move. Take a look at the videos, you should see all of the movements above visually in the game-play. Does that answer your question? 1) Fairly heavily towards the Shadow Striker. Neymar broke all of the goal-scoring records whilst Dybala hit around 20 each in the league and 30 each in all competitions. Messi did the same at Shadow Striker in the first season and Neymar scored more impressively than the others from Inside Forward hitting 33 in the league whilst Suarez managed 24 and 23 in season one v two. From midfield, Messi got 10 in the league, 20 in all competitions but 30 assists. 2) I have mixed corners, but only 4 options in the box - Centre backs, Busquets and Suarez on the far post. The ball is generally crossed in, but then I almost always win the 2nd ball and build from there. Short crosses were often closed down. Enjoy. Good luck with Burnley! Oh and re Oliver Torres. Let me get back to you. He's joining on a free transfer in the summer. Couldn't resist his creativity and technical ability, he's in for a shock training as a Ball Winning Midfielder with extra Stamina until he gets his work rate up. Worth a gamble, I'd say. It's weird, when I set up TIs like you do, my passing appears to be shorter than in your TIs, see screen. Or am i missing something? Hello @Ö-zil to the Arsenal!, during the game, what are your common changes? Do you change any TI or do you change any of player position? 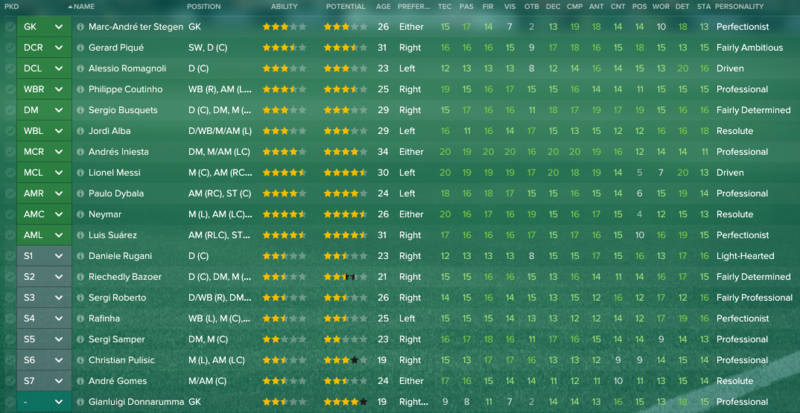 I believe there was some kind of bug in FM16 where, depending on the order you clicked on specific TI's, the graphical representation was different, even if the effects were the same in the ME. You appear to be right. That's odd. Shouldn't be noticeable anyway. Pretty minimal. I have 4 instructions if that helps? I'll put Coutinho into an attack role, if I'm dominating possession but not creating chances to overload the right. I also rotate Samper heavily with Iniesta to keep Iniesta fresh at 34. Rarely needed to make tactical changes. There is still an issue with the graphics representing the changes. For example, the same happens when changing formation, the player familiarity doesn't always represent accurately. Think you may have missed my edit earlier, if not apologies. Wow. Possibly your best work yet. Two questions immediately come to mind. 1.) No man marking instructions - never had a single issue with Suarez or Dybala failing to track back. Nor - surprisingly - with Coutinho or Alba, which I was very worried about. Keeping it very simple there. 2.) Not sure I understand question two - why do you say nobody occupies the half-spaces? Messi, Iniesta, Dybala, Suarez and Neymar all occupy half-spaces multiple times throughout the videos, Messi and Iniesta in particular. Or do you mean that they don't start there on the Tactics Creator? And what effect would half-spaces have on a back 3 spreading wide? The back 3 spread wide in order to make themselves difficult for the opposition to press. The idea being that they have time, they can drag the opposition out of position and that they have 3-4 passing options available in space - which may or may not be a half-space. You could probably get more movement in the half-spaces having a flat 3 midfield, two wide midfielders instructed to move into the channels. But then you'd lose the Half-Back dropping into defence or need to sacrifice a player elsewhere. Depends if you see a benefit. Sorry, on question #2 I am referring to this picture. I'm not sure how common this shape was but being relatively early in the build up phase I'm assuming it was a pattern. I was suggesting that perhaps either the wing backs tuck narrower or the CMs drift wider in order to occupy the half spaces and have more coverage in their spacing. It could be this was an anomaly after looking at the Iniesta video. Hopefully this clears it up.